4 bedroom, 2 bathroom villa in the Southern Dunes Golf & Country Club community. Owned by Alan & Denise Nurse. Ref: 2147. 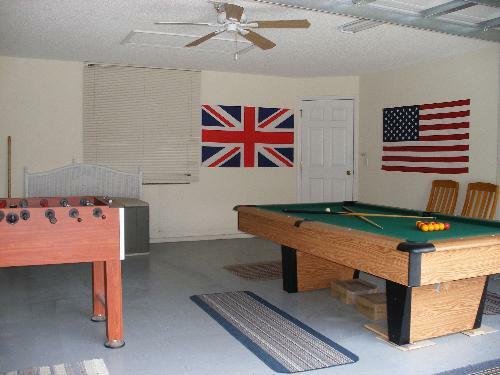 Games Room - Foosball, Darts.. Superb Luxury 4 Bed Villa Located on Top Rated Golf Course. Large Corner Plot For Added Privacy. Alarmed Patio Doors leading to Pool. Numerous Amenities On This Delightful Gated Community. Located on this top rated golf course our villa offers all the luxury you would expect and more! Set between the 7th & 8th hole of this beautiful golf course. The villa is fully equipped with all modern appliances. It boasts its own private screened swimming pool and surrounding garden. The complex also offers a large community pool as well as childrens play area, tennis courts and fishing lake. The golf clubhouse is also open to all residents. All these luxurious surroundings are located only 20 mins. from Disney and all the major attractions. Both coasts are only 1 hour away. Luxury 4 bedroomed villa located on corner plot on top rated golf course Southern Dunes Golf & Country Club.Southern Dunes is a gated community for added security and safety. Accommodation consists of Lounge, Breakfast area, Kitchen, Utility room, Bathroom, Double Bedroom, Twin Bedrooms x 2 and Master Bedroom with En-Suite and Dressing Room. The villa is Air-Conditioned and also has central heating for chilly winter evenings. A large double garage can be accessed via internal door or by manual garage door. 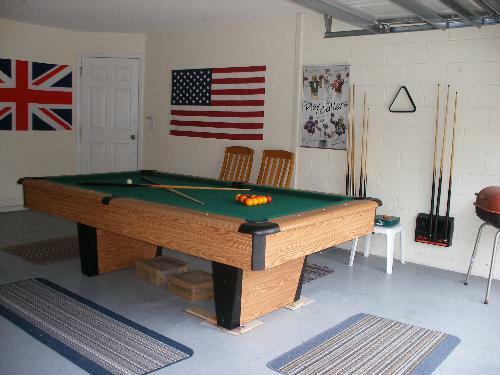 The garage has been converted to a gamesroom which offers 8ft Pool table, Foosball & Darts. The Kitchen houses all modern appliances including cooker, fridge freezer, microwave, coffee maker, juicer, toaster and waste disposal unit.The telephone is located in the kitchen. The Utility Room houses large washing machine and tumble dryer. An ironing board, iron and hoover are also stored in this area. The Living Area has large 3 seater sofa and two seater loveseat as well as coffee tables and tv unit which houses a dvd player. Numerous channels are offered via cable including Premiership Football on the 40" Flat Screen TV. A Playstation2 is supplied for our younger guests and those young at heart! A large six seater dining table and chairs are also located in the living area. Alarmed Patio doors open onto the pool area. A Seperate Breakfast Area is located close to the kitchen which is furnished with table and four chairs. All the bedrooms have built in wardrobes and clothes chests with bedside lights. 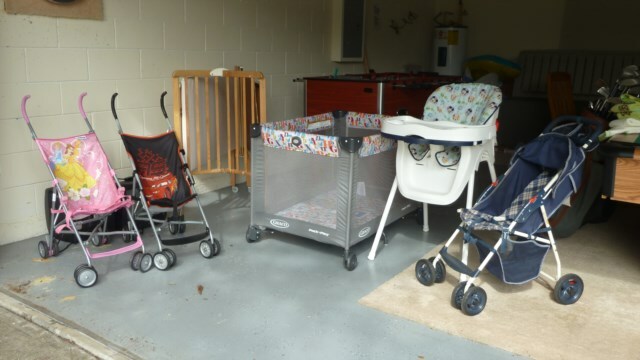 A cot & highchair are available for smaller guests! The Master Bedroom with queen size bed has walk-in wardrobe and en-suite with door out to pool area. Alarmed Patio doors open to the pool area. A 32" TV is in place for your enjoyment in the master bedroom. A hairdryer is also available for guests use. 2nd Bedroom has a full size size bed. A large double built in wardrobe and 4 draw chest as well as 2 bed side tables gives ample storage space. A 21" TV is located in this bedroom. Bedrooms 3 & 4 have twin beds, built in wardrobes and 3 draw chests. 14" TV's are located in the twin bedrooms. 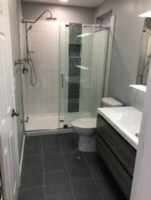 Bathrooms Both main and en-suite bathrooms have a shower, toilet and wash basin. The main bathroom also has a bath. The bathrooms are fully equipped with towels and linen. The house is carpeted throughout for added warmth and comfort. The Pool Area has 4 cushioned loungers as well as 4 cushioned chairs, 4 Pool Chairs and table offering top of the range comfort . 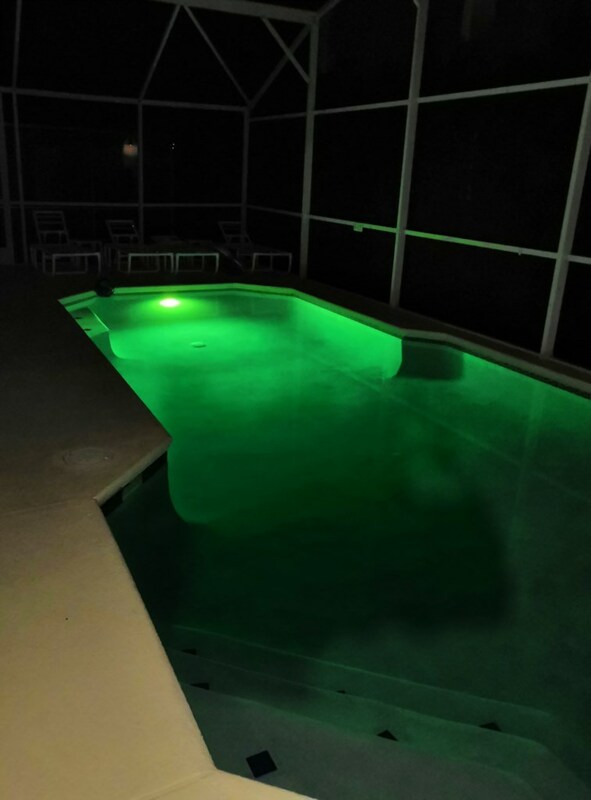 The patio area and pool are fully lit. 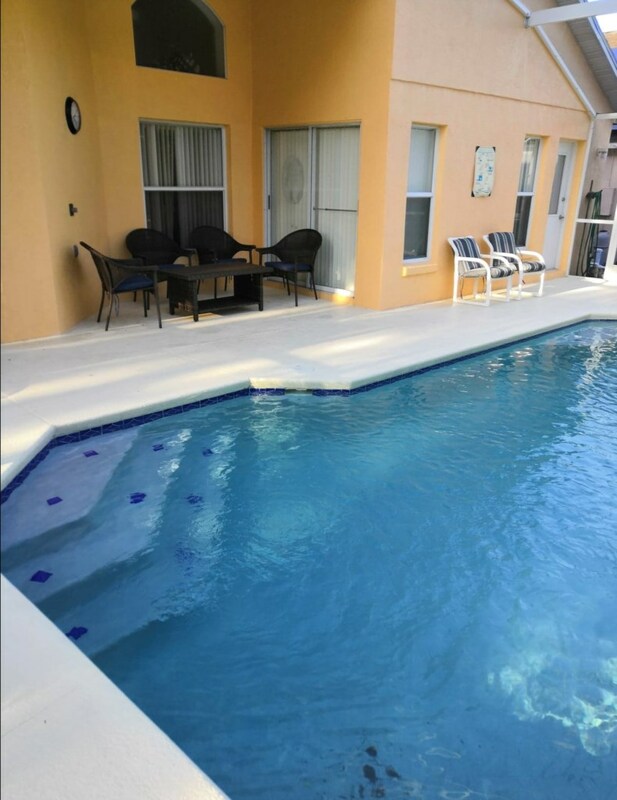 Pool heat is included for the duration of your stay. FREE Wireless Broadband-just bring your Laptop! Our Management Company located on site is available 24/7. Walmart superstore is situated at the entrance to the complex which stocks everything you would ever need! There are several restaurants locally including KFC, Popeyes, Burger King, McDonalds, Checkers, Dominos Pizza, Taco Bell as well as chinese, steak houses and grills. Several of the outlets also provide a delivery service. All the major attractions are within 30 minutes drive of the property including Disney, Universal, Sea World and Wet 'N' Wild. The International Airport is approx. 45 minutes away. Low season prices from $800.00 / £450.00 per week. Peak season prices from $1100.00 / £600.00 per week. All rental rates include Taxes,Cleaning and Utilities. For bookings of less than 7 days a cleaning surcharge of £30/$50 is required. Discounts offered for bookings over 14 nights and for under occupancy. Payment can be made by us dollar cheque, sterling cheque, bank transfer or by credit card using Paypal (payments to be made in dollars if using Paypal). Please note we do make an admin charge of 3.5% for payments made by credit card. Owner's response: Thanks for your review Rob, glad you had a fab time. My family of seven, grandchildren, daughter, son in law, wife and myself had a fabulous holiday this year. It was based around staying in the wonderful home of Denise Nurse on the Southern Dunes. The location was perfect for our holiday, 30 minutes to Disney and 1 hour to Busch, lots of places to eat locally and Walmart within 500 yards. The days we stayed at "home" we had our own pool or three pools on the complex to use, the kids were in heaven. Owner's response: Thank you for your kind words. We look forward to hopefully welcoming you back sometime in the future. Owner's response: We are so glad ypu enjoyed your stay and thank you for your lovely comments. We look forward to welcoming you back! What a great vacation retreat! We would highly recommend this home. The location is close to all of the Florida activities, as well as shopping and food supplies. The home is very clean and well equipped for your needs. 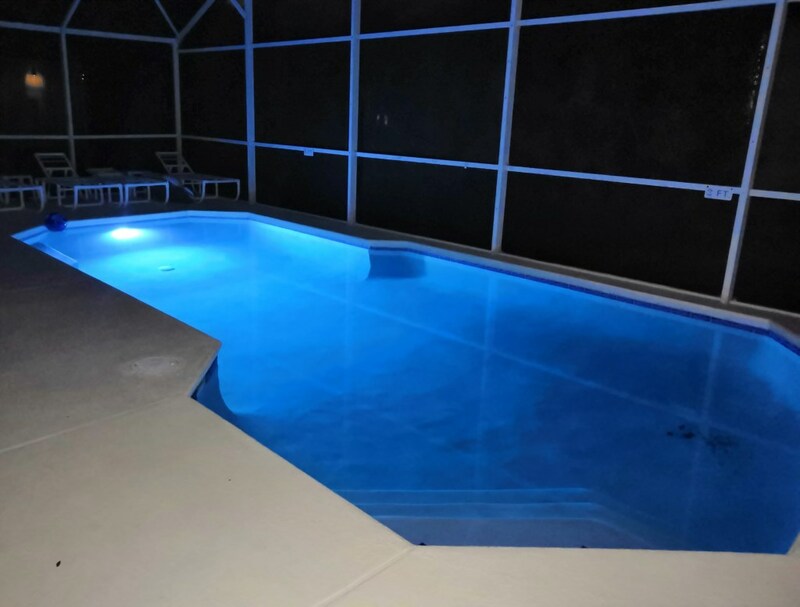 The pool was clean and warm....If you rent a home during this time period make sure to spend the extra for pool heat....It's worth it. 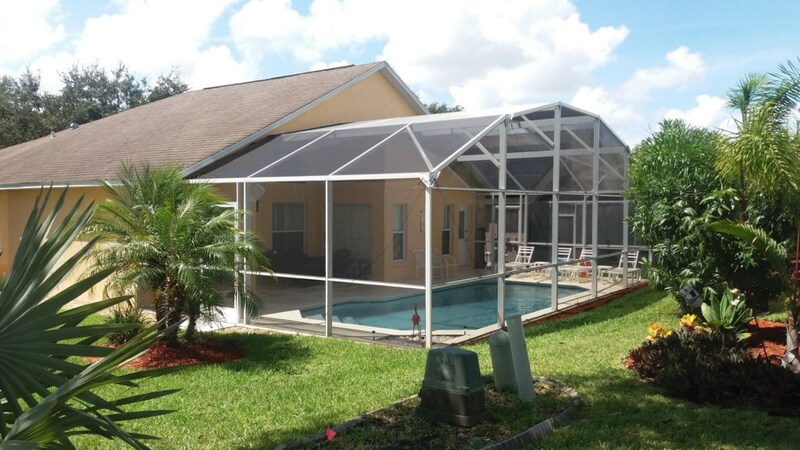 We hope that if you have the chance to experience Florida, that you use this property. Owner's response: Thanks for taking the time to review our home, we are glad you enjoyed your stay and hope to welcome you back in the future. This is the second time we have stayed in this lovely home, both times for six weeks each. We come for baseball spring training season and also to enjoy the theme parks and restaurants. We were fortunate to book this home and will never stay anywhere else. It is large, sunny and equipped with everything you would need for a long or short stay. 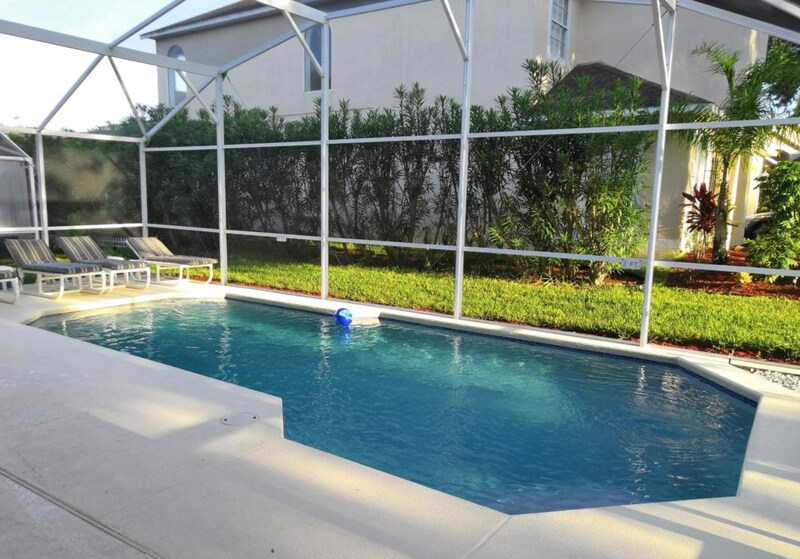 The gated community offers a feeling of security and it's both quiet and well maintained. We have already booked our next stay and just can't wait! Owner's response: Thanks Laura, we look forward to welcoming you back in 2017! Really enjoyed our time at this Villa in Southern Dunes. The villa was clean, spacious and adequately furnished. 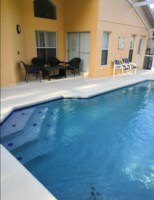 The location was awesome, close to amenities but traffic heading to and from Orlando attractions can be slow. Owner's response: Thanks Julie, it was a pleasure welcoming you to our home! Your enquiry will be sent to villa ref 2147 only. This page has been viewed 37362 times since 21 May 2005.